Moissanite is an extremely rare mineral that was discovered in a meteor crater by French chemist Henri Moissan in 1893. Today, all moissanite available in the marketplace is synthesized in laboratories, and North Carolina-based Charles & Colvard is known for creating the world's most stunning moissanite stone. Forever Brilliant ® Moissanite is up to four shades whiter (equivalent to a diamond with H-I color) than conventional moissanite (Forever Classic™), and Forever One ™ Moissanite gemstones are magnificently colorless (equivalent to D-F color diamonds). Both varieties are 10% more brilliant than a diamond and have a hardness of 9.25 on the Mohs scale of hardness, comparable to a diamond's score of 10 (the hardest possible). Click here to browse our loose moissanite options. 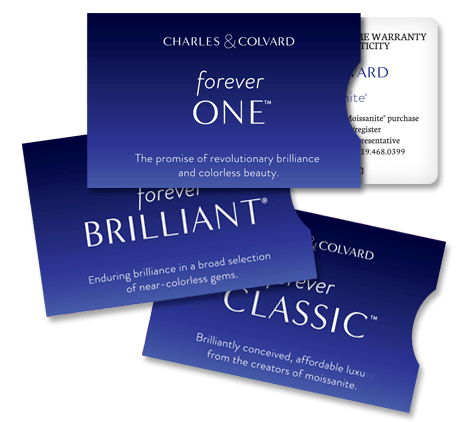 Charles & Colvard provides a Limited Lifetime Warranty of your Forever Brilliant ® or Forever One ™ Moissanite for maintaining its brilliance and color. In the unlikely event the optical properties of brilliance and/or color alters in a Forever Family jewel, the jewelry, along with the original sales receipt and this warranty card, which comes in its own branded sleeve, must be returned to the retail place of purchase. Please note that jeweler costs to reset any replacement Forever Brilliant ® or Forever One ™ jewel as well as shipping fees may apply. If you have any questions, please contact deBebians and a customer service representative will assist you. This warranty does not cover damage as a result of abuse, misuse, loss or theft of your Forever Brilliant ® or Forever One ™ jewel. Additional terms and conditions apply. See Charles & Colvard for complete details. When comparing the carat weight of a moissanite gemstone to a diamond of the same size, the moissanite will weigh less. Therefore, we prefer to use the millimeter (mm) measurements when referring to our moissanite sizes. 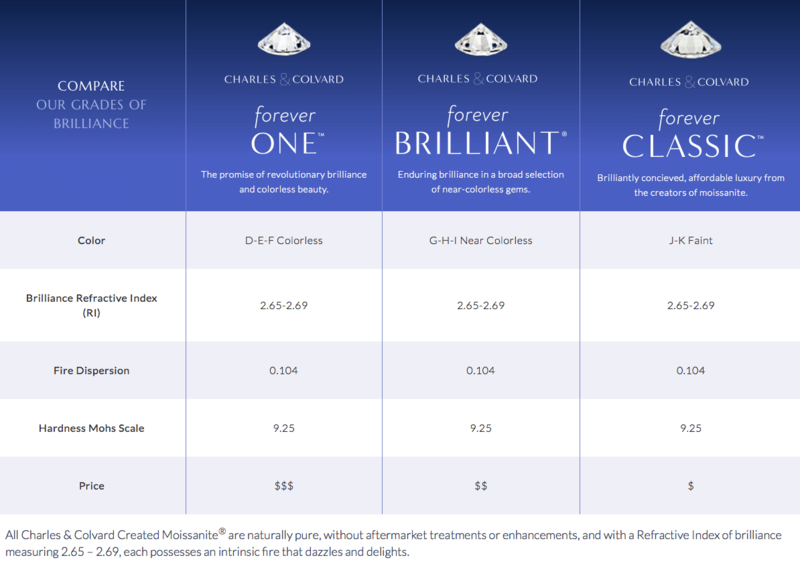 Here are some handy charts to compare moissanite and diamond sizes to their equivalent carat weights.